It’s another snow day as Mother Nature's winter fury hits the region. Environment Canada has issued a winter storm warning on Tuesday due to hazardous winter conditions that include snow, ice pellets, the possibility of freezing rain, and strong winds that will take us into Wednesday. The weather agency says we could see up to 25cm of the white stuff with winds gusting to 70kph. Motorists should brace for some white knuckle driving conditions with reduced visibility. Senior Climatologist Dave Phillips tells CTV News that drivers won’t even be able to see the hood ornament of their car because of the blinding, blowing snow. Several events, classes and programs have been cancelled. Georgian College in Barrie and Lakehead University in Orillia have closed for the day. Arrivals and departures at Toronto airports are clogged with cancellations and delays. 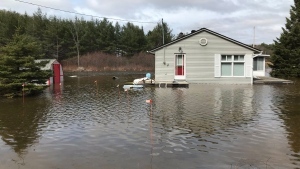 The weather system is associated with a Colorado low that's expected to move out of southern Ontario on Wednesday and into New Brunswick and Nova Scotia, which were also under weather warnings ahead of its arrival.